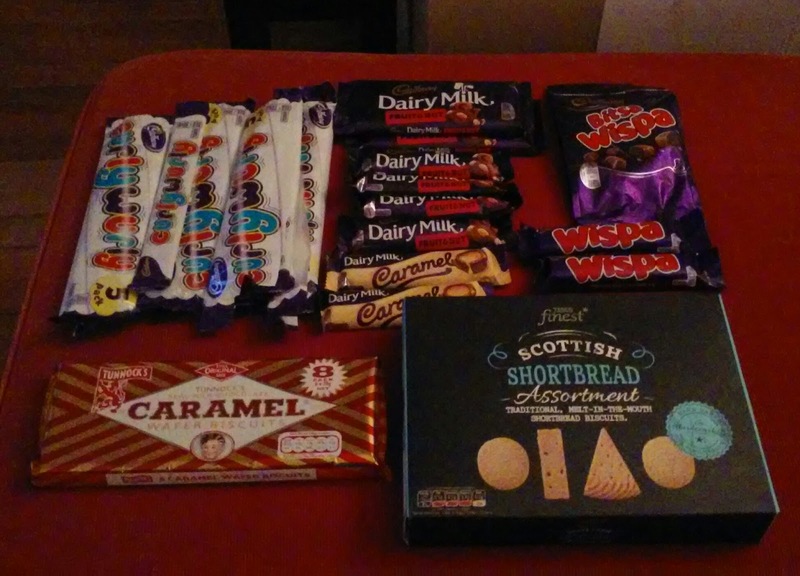 Larry came home from London today, bearing chocolate, plus shortbread. He did an EXCELLENT job, so I might let him go back, if he ever has the chance. You know when you realize home-owning is fun? When you have to unclog the powder room toilet the minute you put down your suitcase. 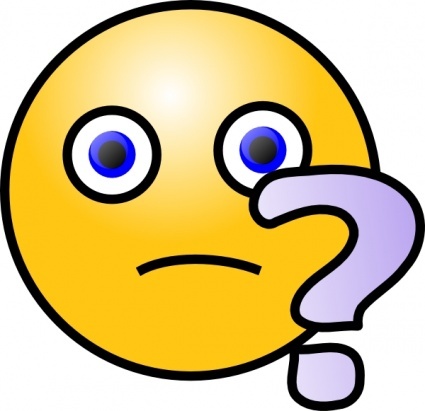 For some reason, this week while Larry was gone, ALL THE THINGS happened, so the poor man was bombarded with information the minute he walked in the door. Larry heard all about Brian's audiology appointment (poor kid was going deaf in one ear, because I am the WORST mother in the entire world), the line-up of activities we are scheduled for this weekend, David's plans for the summer, Theo's present whereabouts (he left for the Mideast the same day Larry left for Europe), and then Anna's money-saving decision to move back home for the next few months. I swear, you'd think he had been gone a year. And now I am realizing that we didn't even get around to telling him about Brian's latest dumb accident (and believe me, it's even dumber than when he dropped his own pants in the potty). When I walked into Brian's room Wednesday morning to make sure he was up for his doctor's appointment, I found myself staring at a ceiling fan with a missing blade. I looked at the wall, expecting to find the blade embedded therein. But no, it was lying quietly, brokenly, on Brian's desk chair, and it didn't look as though there were any blood stains in the room; so, all in all, it could have been worse. Housekeeping tip for the kids: turn off the ceiling fan BEFORE standing on your bed and trying to unbunch your duvet. And, yes, I know, this is my fault - I shouldn't insist that the kids make their own beds. Or at least, that's what Brian tried to tell me. Mea culpa. Tonight I went up to Baltimore to see its Listen To Your Mother show. I also got to meet Ann Imig (the founder of the whole LTYM phenomenon) in person, because she happened to be there, too. So, yes, that's me, rubbing shoulders with the (blogging) famous. Next thing you know, I'll be trading recipes with the Pioneer Woman. I mean, it takes some special skill to throw together Costco frozen meatballs and Ragu spaghetti sauce the way I do. Those jars don't just open themselves, you know. And now we are getting ready for LTYM DC (next week! ), and Larry's packing for a business trip to London (next week! ), and Brian tells me there is the homeschool prom (next week! ), and suddenly I cannot wait for May, when I have absolutely nothing planned - at least, nothing that I can remember. And yes, "homeschool prom" DOES sound a little weird, like we have a spelling bee instead of music and dancing. But it's actually a pretty normal prom, except nobody gets drunk before or after, which strikes me as a definite plus. And since I have only a teen boy going this year, there really isn't much prep to do. Still, Larry has to chaperone, and then there is the after-party, and then we have the neighborhood clean-up event early the next morning. So, like I said, May cannot come quickly enough for me. It doesn't hurt that Larry has promised to get my car cleaned, inside and out, which strikes me as the best Mother's Day present ever. 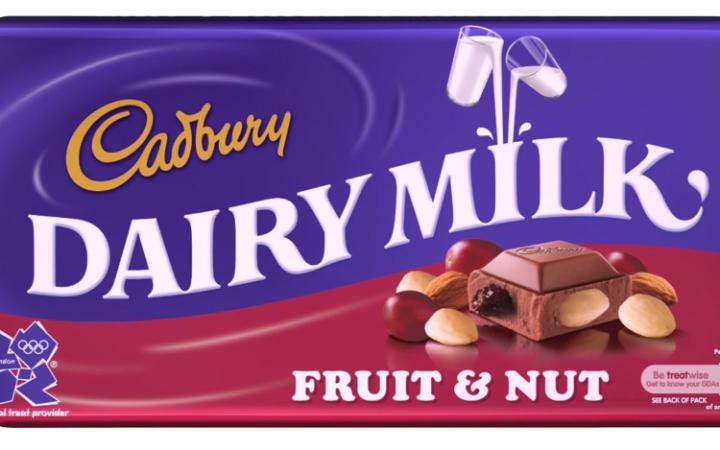 Well, that, and some Cadbury fruit-and-nut bars, to be picked up while he is in London, because the British version is WAY better than ours. Today I get to wait around until the windshield-replacement guy shows up. I drove around for a full week thinking to myself, "When I get out of the car, I've GOT to remove that blade of grass on my windshield." Then I would forget, because - let's face it - you drive your car to get somewhere, and once you get there, that is all that is on your mind, not removing blades of grass from your windshield (which explains why, for SEVEN YEARS now, I have been forgetting to superglue the loose door gasket in place, so every once in a while it falls on someone's head as they are climbing in the car). Anyway, then I noticed that the blade of grass seemed a tad longer and one day last week the sun caught it at just the right angle to reveal its true nature - a crack climbing up the windshield right in front of me. So it was sort of a Trojan blade of grass, as it were. Acting completely out of character, I immediately called the insurance company and set up today's appointment. Seriously, I don't know what came over me, but I am glad I did, because that crack is now twice as long and right in front of my face as I am driving. All of which is to say, SOMETIMES I get it right. ME: So, judging from the read-through last night, we shouldn't bring the girls to the LTYM show. Think they're okay if we just leave them here for the afternoon? ME: The Listen To Your Mother show is on May 1st. Can the kids stay by themselves at home? This is what he looked like, I swear it. ME: Do you have ANY idea what I am talking about? HIM: Wasn't the show last night? ME: No! That was the read-through. ME: You thought I was performing in LTYM last night and you just waved bye? Didn't you want to SEE it? At this point, Larry is sitting there with the classic confused-husband look. I take pity on him and try again. Slowly. ME: Last night we were all reading our pieces to each other to hear how they sounded together. The SHOW is on May 1st. HIM: I thought you changed it. So last week was the cast party and this week was just practice? When's the show again? ME: May 1st. Can we leave the girls alone here while we are at the show? More confused-husband look. I mean, what is there not to understand? I try to ignore him and finish my breakfast, but the sensation of confusion emanating in WAVES from his end of the table is overwhelming. I lose it. ME: Larry, this isn't that hard! The baffled look on his face doesn't change. I turn to Brian, who is sitting across from me. ME: You understand this, don't you? BRIAN: I thought you taped the show last night and it would be on YouTube today. All this to explain why I'm giving my free ticket to Anna. These menfolk don't even DESERVE to see the show. This week has just rocketed by. Theo's transfer date (he's going overseas) was moved up, so what was supposed to be a nice, leisurely visit spanning a week was changed to only 3 days, days filled with bureaucratic minutiae like changing his car registration, among other things. He arrived earlier than planned, too, the same night I was hosting Bunko, so I got to prep for Bunko (that is, clean the house, buy fun food, make other fun food) at the same time I was prepping for his visit (de-cheese the house, clear the guest room, etc.). Due to my general organizational ineptitude, this was not easy. Rachel would NOT like this dress. We did find time to go bowling, however, despite the short visit. (Hey, who says we're not an athletic family?) Susie wanted to show Theo how she can bowl strikes, and Larry and I were grasping for any opportunity to hang out with him, so that made all of us happy - well, except Rachel, who happens to be 13 and not excited by the thought of family togetherness. Probably Theo felt the same way, but - happily - he's old enough now to humor us in our fantasies of fun family outings. Add to all that a visit from Uncle Matt and a read-through for the Listen To Your Mother show, and I am fairly done in. 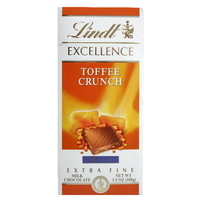 The LTYM read-through required me to act extroverted for almost 6 hours straight (we met for dinner ahead of time), which exertion must have numbed my brain cells - I grabbed some lovely Lindt chocolate-toffee squares for the ride home but unwisely stored them in my pants pocket. This resulted in a scene which can only be described as pathetic - a middle-aged woman (um, that would be me) standing in her living room at 11:30 PM, licking melted chocolate from candy wrappers. Not exactly how I pictured my life would be at this point, really. I mean, when does the grown-up part happen, anyway? Larry stopped by our credit union yesterday and, while he was there, decided to check out the new car sale going on. I don't really understand WHY there was a new car sale happening there, but hey, it seemed convenient. Anyway, long story short, he went into sticker shock when he saw the prices ($37K for a minivan? Really?) 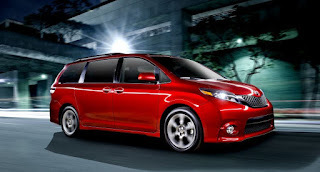 True, it's been 7 whole years since we bought our Toyota minivan (which is hard for us to remember, because, hey, we still call it the "new" car), so I guess prices have gone up a bit. Still, that's a LOT of dough. Is everyone paying that nowadays? And how much longer do you think we can make our 2004 Honda Odyssey last? Yes, we ARE a two-minivan family. We refer to it as "the fleet." In other news, last night I attended a cast party for LTYM DC that included former cast members. It is sort of a blur, but I vaguely remember going all fangirl when introduced to someone from the very first year (2012), someone whose piece I loved. Also, it gradually dawned on me that many of these women were fairly serious about writing. I mean, there was talk of writer conferences and fellowships and how to get the attention of the Huffington Post, among other things. It's hard to describe how it feels to meet a whole bunch of these women at once. Picture it - I sit here in my den, writing my silly little blog posts for what? 8 or 9 years now? Toiling away in relative obscurity, as it were, all while attending LTYM and following other people's blogs. Suddenly, I am in a room full of flesh-and-blood people who take this stuff seriously. People who talk about writing stories as if it is something important, something that matters. It's as if a world I made up in my head turned out to be real, imaginary friends and all. So, yeah, a pretty cool experience all around. 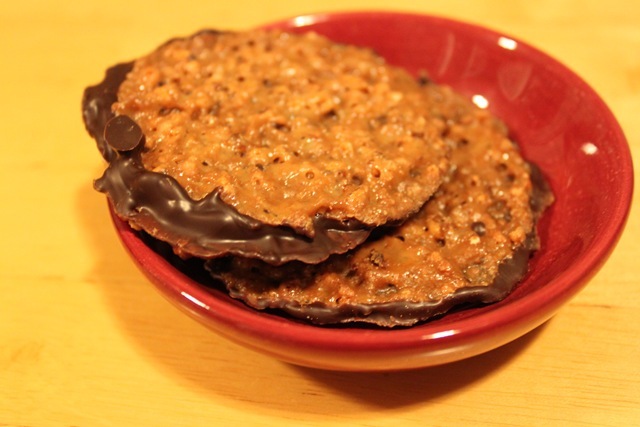 Also, the hostess had those awesome Trader Joe's crispy cookies that have caramel and chocolate inside. You know, the thin, crunchy ones that look sort of lacy on the outside? When I wasn't fawning on former LTYM people, I was taking it upon myself to save everyone the calories by eating as many of these cookies as I could. I'm nothing if not a team player, you know. Don't you hate when you discover a new calendar app that promises to make your days more efficient, and then you waste an entire morning figuring out how to enter things in it and how to make a priority to-do list? Then I got on here to blog and of course had to check a few other blogs first (really, blogging is the 21st-century version of the coffee klatsch, people) and somehow ended up on YouTube, grooving to Joe Jackson's "Happy Loving Couples." It is a wonder my children ever get fed, actually. In other news, my fiendishly fit friend convinced me to once again sign up for the local Tour de Cure bike ride. Considering that the event is at the beginning of June and here it is April and still not biking weather outside, I am going to be as fabulously unfit for this ride as I have been the past 2 years. The only thing I've got going for myself this year is that I had my handlebars adjusted so the top half of my body is no longer heading downhill when I sit on my bike. While that posture was an excellent arm strengthener, it always made me feel as though I were about 5 seconds away from catastrophic death. The adjustment also means I can actually reach the brakes with more than the tippy tops of my fingers. Being able to stop when needed is a real plus. Of course, my fit friend went out and bought herself a bicycle that has those fancy pedals you clip your shoes to. So, yeah, I'm not going to be able to keep up - not in the least. The best I can hope for is I won't have a repeat of the first year, when an entire team of bicyclists began yelling at me because I didn't start pedaling quickly enough at a road crossing. Friendly. Real friendly. But what could I expect from a group that had the name "Chain Gang" emblazoned across their biking jerseys? I'm lucky they let me live. Whoops, missed a day here, because my neighbor who apparently spends her ENTIRE DAY walking invited me to her workweek FitBit challenge. Sure, I thought, I walk a lot. I can do this. Apparently not, as she is now 10,000 steps ahead of me, and I have only 2 days to catch up. Seriously, people - I walked the girls to a book sale at the school today, I walked to Michael's with Susie, and THEN I walked to the grocery store. After that, I ran up and down the stairs, cleaning the house for our history class tomorrow. Yet I am still behind on steps. I think maybe my neighbor is handing her FitBit to her 5-year-old son, feeding him some sugar, and sending him out to play. In other news, my marriage breathed a sigh of relief as Mulch Weekend came to an end. Finally, Larry and I could talk to each other again without the "M" word coming up! Maybe we could go see a movie, even, or take a walk together. It was a wonderful 2 days, and then Larry told me that he has to go to London at the end of the month for his new job. He tried to make it sound as though it were a real inconvenience for him, too. I stopped talking to him anyway. LONDON. I hear it's nice. But, hey, I see it all the time in Dr. Who episodes, so I'm good. So now it is 11 PM and I am considering going outside and walking around and around our neighborhood, just to gain 2000 steps or so. If you had asked me a couple of weeks ago, I would have claimed that I was not the competitive type. Apparently, I would have been wrong. The weather can't seem to make up its mind around here. But, really, a spring cold snap doesn't bother me - it just provides me with the prolonged opportunity to wear my handknit socks. It's all good. I joined my friends for the last day of their yarn crawl yesterday - we only hit 2 shops, but I still managed to spend a considerable amount of money. It's weird what happens in a yarn shop - you come up with all sorts of knitting plans you had no idea you wanted to do. That might explain why, surrounded by the CUTEST acrylic/wool yarns ever, I decided that I needed to start a grandmother hope chest - you know, in case any of my kids ever decide to reproduce. 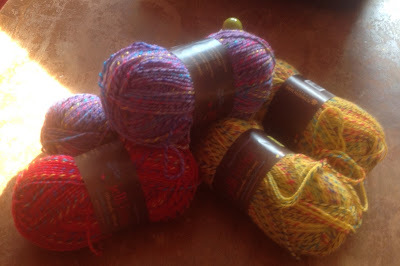 That picture doesn't do the yarn justice, as I am the world's worst photographer. I guess I can't use the excuse that it moved just as I was snapping the photo? Some other stuff found its way into my bag, also - random sock yarn, mostly. We also went out to lunch, and then there was a stop for sorbet/gelato after the second store. Have I mentioned that Larry and the kids and their Scouting compatriots were still finishing up the mulch deliveries? That made my freedom all the sweeter. A Scout mom came up to me during our mulch delivery today, someone who is considering taking over the Mulch Czar position in a couple of years. "Tell me," she said, "how much prep time does your husband spend on all this?" "I have no idea," I told her. She looked confused. "No, seriously," I said. "We don't talk to each other about mulch at all. I do my thing, he does his." Look, we would like to stay married, all right? This is what it takes. I don't know why people don't understand that. And if you doubt some of our troop parents' dedication to this project, let me tell you that my main food-tent staffer cancelled a chemo appointment on Friday, just so she would be up to the task of making coffee and hotdogs and grilled cheese all day Saturday. THAT's commitment. Of course, that also made my leaving mid-afternoon to take a nap look pretty pathetic. But hey, I'm not trying to win any awards here. See how happy and relaxed they look, loading their truck? That wasn't us. I spent most of the evening standing by the cones at the entrance to the parking lot, making sure people heading to the high school baseball game didn't drive in where we were loading the trucks all day. I just realized that I made a point of complaining to the other woman there that I am better off pacing back and forth than standing still like that - standing still makes my leg hurt in this weird way, you know, like my knee cap falls asleep and then it spreads down my calf and up to my hip. The woman working the entrance with me? She was using one of those electric scooters. As in, she can't really walk much at all. In retrospect, I'm sure she really felt sorry for me and my achy leg. I'm such a dope sometimes. I mean, really. I'm still alive. We're just headed into that marriage-testing vortex known as Mulch Weekend, so time to blog has been scarce. I'm seeing Sign-Up Genius web pages in my sleep. But hey - we won't be having to take cold showers this year, so that's a plus! Click on that last link - it's a good one. 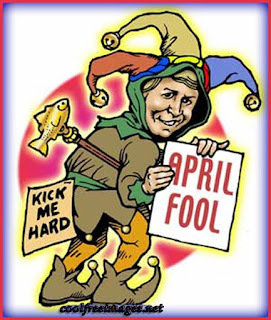 As per usual, I am avoiding the Internet today, anyway - April Fool's Day has never been my favorite holiday, maybe because I'm gullible as heck. So there's a plus to having to do mulch this weekend. It doesn't make up for my having to miss out on an epic yarn crawl with my knitting posse, but it's something. This just doesn't scream "FUNNY!" to me. Does anyone say "posse" anymore? Probably not. I'm being antiquarian today, apparently.